We would more than gladly appreciate it if you could send us some information on some of your favorite European bookstores you would like to share with us and the rest of the world. You can E-MAIL us. Or, if you desire to provide a financial support for Bookstore Guide, visit our Support page. Any given amount is more than appreciated. Hello! We are Sonja and Ivan. 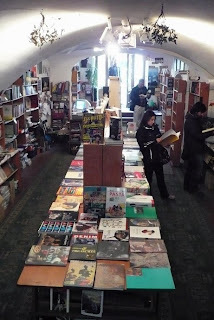 And this is our Bookstore Guide - an amateur guide to book shopping throughout Europe. We hope this Guide will help you find the book(stores) you are looking for. Kelly said: "Anagram is fantastic, located in a quiet courtyard behind the Týn church. " 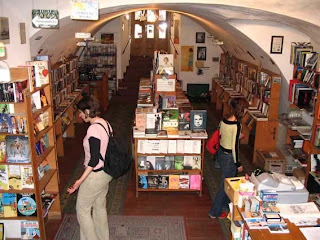 Tucked away in a cellar of one of the old Baroque houses behind the Týn Cathedral in the capital of the Czech Republic, this lovely little shop has a large selection of English books to offer to its avid readers. Carefully selected and visibly laid out, the books on display make you feel like you've entered a world of words and letters that were just waiting to enchant you so you would become their permanent owner. The whole relaxed atmosphere of Anagram, with its rustic old-fashioned carpets, cellar walls and wooden shelves, just makes you feel like you are in a world remote from reality, a world where time has stopped and given way to books. Anagram is a friendly bookshop where many people, among which many are expats, regularly meet eager for a good read, to chat with their friends or simply to enjoy a browse through some of the new arrivals. For the full feeling and experience of Anagram Bookshop, visit the 360 degree view of the store. Anagram, a tiny bookstore consisting of two rooms in an old cellar on Týn Square, has a wide selection of both second hand and new books, historical books about Central and Eastern Europe, a more than satisfying fiction selection and some beautiful art and photography books. The staff is more than helpful and will take your order for any book that they don't have on stock. Prices at Anagram range from moderate to moderately high - but we do not need to stress out once more that Prague is generally not a cheap city, so Anagram actually belonged to the more price-friendly English bookstores we have visited in the city. ©2007-2018 www.bookstoreguide.org All rights reserved.